At the recent AMDAC, the frequent mention of an unusual uUTI study caught my attention. In their review of placebo-controlled trials, FDA mentioned a study comparing ciprofloxacin with Ibuprofen (Motrin), an NSAID drug without any antibacterial activity. By the outcome of total symptom relief, there was no difference. Obviously, there was no difference regarding any of the dimensions of “function or survive” either. Does this mean that antibacterials are not needed to get over an episode of uUTI / acute cystitis? Should we withhold antibiotics for the milder forms of UTI, relying on Mother Nature and hoping that our immune system will be primed by giving it some work to do? Obviously, uUTI is an entity with a high self-cure rate, with figures anywhere between 25-50% being bandied about. Antibiotics are often prescribed with the assumption that bacterial eradication is somehow linked to clinical improvement, ie, faster improvement. After all, having a therapeutic which takes care of the cause of a condition, not just providing symptom relief is a unique attribute of antibiotics. If uUTI were a viral infection, we would not have a problem treating dysuria with an analgesic. The underlying reason for anti-infective use is to avoid ascending infection, pyelonephritis, recurrence, and complications like urosepsis and renal abscesses. Admittedly, these complications are rare. But complications do occur as there is a disease spectrum: the only difference between uUTI and pyelonephritis is fever (not seen in all cases) or flank pain (also not in all cases). The clinical acumen does not sharply differentiate lower from upper tract involvement, a reason why pyelonephritis is often lumped together with cystitis under the rubric of uncomplicated UTI. And a patient diagnosed in the doctor’s office with uUTI may feel reassured and not come back when upper tract symptoms develop. With only 55 evaluable patients, it would be surprising to find a more than a trend. Indeed, none of the findings reached a level of statistical significance. Equal symptomatic response rates were seen in both arms: non-antibiotic ibuprofen was as good as ciprofloxacin. Bacterial eradication was more often achieved in the ciprofloxacin arm but this was a secondary endpoint. Of note, the strongest trend observed in this pilot trial was the fact that more patients in the ibuprofen group had to come back for antibiotic therapy. Arguably, this should have been posted as the major finding as no other factor had a similar delta in outcome between the 2 groups. There were some rather glaring omissions. For any UTI trial, a urine culture at entry is a sine qua non, and we should also be informed about the CFU count required for study entry. Thirteen patients were included in the PP analysis that should not be included as they did not have an entry culture positive for bacteria. With the urinary nitrite test positive in only 30%, we are wondering whether many of these women had CFU counts in the higher 103 – 105/ml range. 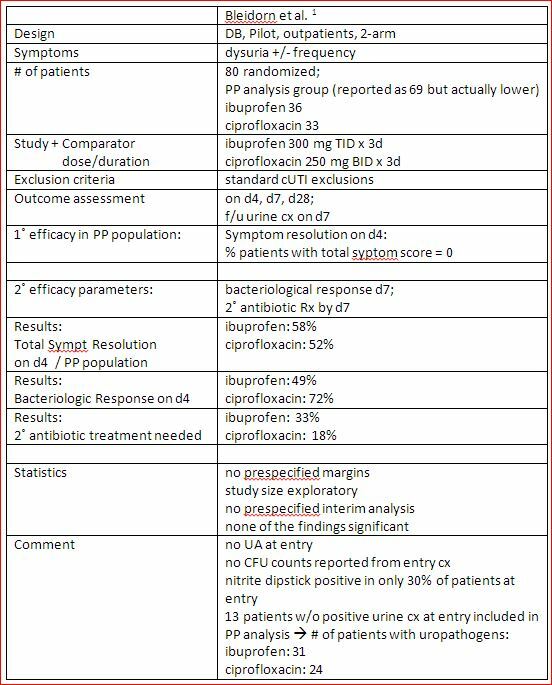 This was a pilot study and cannot / should not be criticized too harshly – a trial balloon to challenge the accepted wisdom of antibacterial therapy for all uUTI patients. It does not measure up with a pivotal registration trial that enrolls a much larger numbers of patients (N= 450-750), is built around solid statistics and has a predefined analysis plan. It is good to know that a follow-up study is in the works. Enrollment finished in Aug. 2014 . Hence, we can expect a publication shortly. This trial has the quality markers of a more definitive study: 494 patients were enrolled to receive either ibuprofen 400 mg qd x3 days or fosfomycin 3 g single dose. Given the attention FDA gave to the pilot trial, the Agency will be even more interested in the outcome of this much larger effort. If nothing else, it may provide the information needed to calculate M1 and M2 criteria for future non-inferiority trials. It will not change medical practice quite yet. Ibuprofen for uUTI (Part 2): Antibiotic or NSAID? Or Both? Or Neither? This entry was posted in Recent Literature, The News, The Viewpoint and tagged Allphase Pharma Consulting, antibiotic benefit, antibiotic blog, fosfomycin, Harald Reinhart, indomethacin, Motrin, NSAID, placebo-controlled, UTI, uUTI by Harald. Bookmark the permalink. ← Previous Previous post: The FDA AMDAC on Fluoroquinolones (Part 2): Where Were the FQ Advocates?